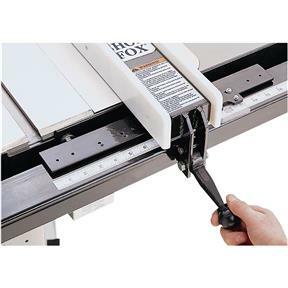 A Classic, time tested and proven design is now part of the Shop Fox® family of high quality woodworking products. This 42" long fence has easily replaceable side panels made of HDPE plastic, a tough abrasion resistant material that is smoother than Teflon®. The heavy walled rectangular tubing of the fence body is powder coated for durability. A high visibility scale allows easy, precise and repeatable settings and the fine lined cursor can be mounted on either side of the fence body, depending on your preference. 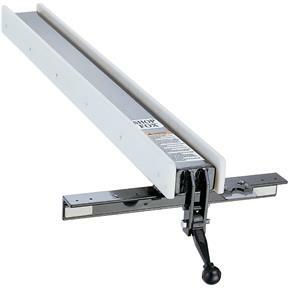 The fence locks positively into position with a cam-action lever, making one-handed fence adjustment a snap. 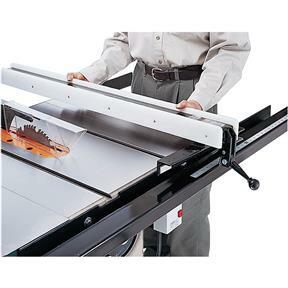 The fence system comes with super heavy-duty front and rear rails which can be mounted on almost any size or brand of table or cabinet saw. Fence rails are epoxy painted for a long lasting finish. The fence can be lifted off the rails anywhere along its length for the ultimate in convenience. Great fence, pretty easy to install with the exception of having to drill new holes in the saw and the fence rails but it wasn't a big deal. I removed a star because the box was open when it arrived, and the only thing keeping it together was the plastic banding. All of the hardware had fallen out and the scale was hanging out of the box. Woodstock needs to seriously upgrade their packaging. After buying new hardware it took me a couple hours to install and set up. Adjustments are easy, and it locks in place solidly. I can't believe I put up with the crappy stock fence for as long as I did. I love the fence so far. Fence 5 star. BUT the packaging is the worst I've ever seen. Packaging ZERO stars. Box was torn and fence exposed but not damaged. Grizzly needs to find someone who knows how to ship this properly. Im surprised it wasn't damaged. Plenty of other reciewers complain about ths same thing. Apparently Grizzly doesn't care about it. The worst packaging I have ever seen. The box was destroyed when it got here. Some minor parts were missing from my order, undoubtedly fell out of the box given the condition upon arrival. If this is the state of packaging sent out from Grizzly, I will never place another on line order with them. Bought this about a month ago. It was easy to install and came with all necessary hardware. The only thing I wasn't happy about was the packing of this item. When it arrived the box was pretty beat up and open in some places. I realize that some of that is due to UPS. It was a heavy package. Fortunately everything was there and nothing was damaged. Leaves my old fence in the dust. It is very true, easy to adjust. Heavy fence. Do not like the bubble magnifier on the measure scale. Will replace with something that does not distort. Was worried it may have gotten dinged up in shipping after I read a review about it...but mine was packaged with heavy duty styrofoam and it got here in fine shape. This fence is stout! And the holes lined up for my old G1023 so no tapping. It does come with a tape device for others that dont lineup which is cool. Cant wait to try this thing out. I would def recommend this fence. Very pleased with the fence. 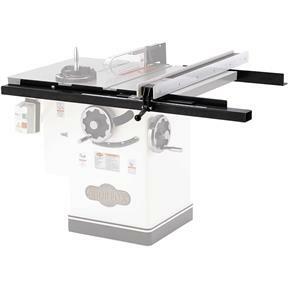 Installed it on a cast iron Craftsman table saw and overall the installation wasn't that bad. None of the existing holes lined up so ended up drilling and tapping new holes. It would be extremely helpful if we were supplied with a drill bit that would cut and also if we were supplied with a starting tap instead of the bottom tap that was included. Other than these annoyance items I was very happy with the quality and service I received.